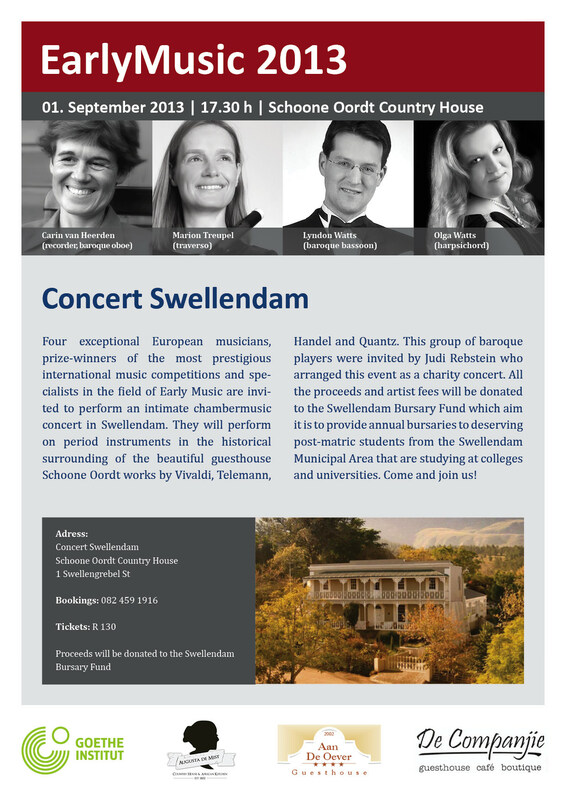 Celebrate the arrival of Spring with the inaugural Swellendam House Concerts: BAROQUE SPRING at Schoone Oordt on September 1 at 17.30. Tickets cost – R130 pp,and that includes a glass of wine and canapé. Only 60 seats are available – get your tickets now by contacting us directly. This special event is the first and we are grateful that the artists are donating their time and talents to a charitable cause. Guesthouse accommodation is sponsored by Aan de Oewer, Augusta de Mist and De Companjie, while Schoone Oordt is donating the performance space, which is one of the finest spaces for this kind of event in town. The programme features a quartet of exceptional European musicians, all leaders in their respective fields, performing works by Vivaldi, Telemann, Handel and Quantz. Co-ordinated by Judi Rebstein whom regular visitors will know from her legendary guest farm Jan Harmsgat and Old Gaol in Swellendam. 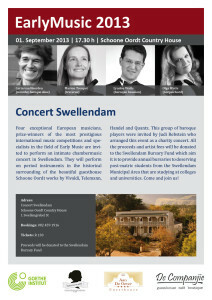 Proceeds and artists fees will be donated to the Swellendam Bursary Fund. Swellendam House Concerts is planned to be a regular event and different styles of music will be presented in various Swellendam homes and spaces as was the case in earlier times. Please contact us if you have a concert idea or a venue suggestion. We are also just so proud and happy to be part of an initiative which actively assists the efforts of the Swellendam Bursary Fund. The Swellendam Bursary Fund Breakfast was established to ensure that the terrible bus disaster of 25 October 1975 would be remembered because of the lives of the 28 people who died and the unity this event created in this town. The Bursary Fund aims to financially assist students from Swellendam to study at a college or university.